Richard Brooks trained in Fine Art as a painter at Hornsey College of Art (now Middlesex University) in North London in the late 1960s. Soon after leaving college he met an architect who required illustrations of new developments. Richard set about learning the considerable technical skills required to produce accurate drawings from architects� plans and as a result has enjoyed a successful career in architectural illustration spanning over 35 years. He has worked on corporate commissions as diverse as football stadiums, apartments, office blocks, golf clubs and holiday resorts in the Mediterranean. Almost all his architectural illustration work has been published. 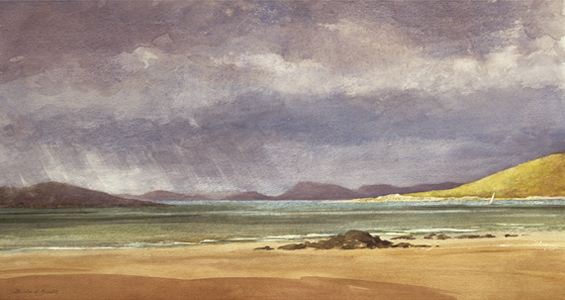 He has also undertaken a number of private commissions for paintings for private clients. During a lifetime of producing high quality watercolour illustrations and paintings Richard has remained true to his roots as a fine artist. A period spent working in Madrid rekindled his desire to paint and he has maintained this alongside his commercial work. His representational style encompasses landscapes, seascapes, snow scenes and townscapes, mostly in watercolour, though he does use oils and pastels in his work. Richard�s pictures are now available to order as giclee fine art prints on high quality art paper, lightfast for up to 70 years.